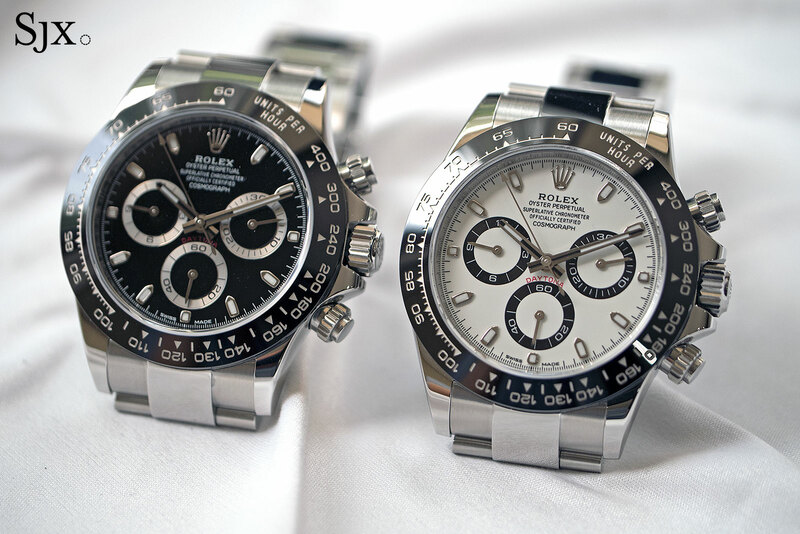 Rolex's new Daytona ref. 116500LN is a bona fide, red hot hit. Here's a reasoned and considered opinion. The acclaim doesn’t stop there. 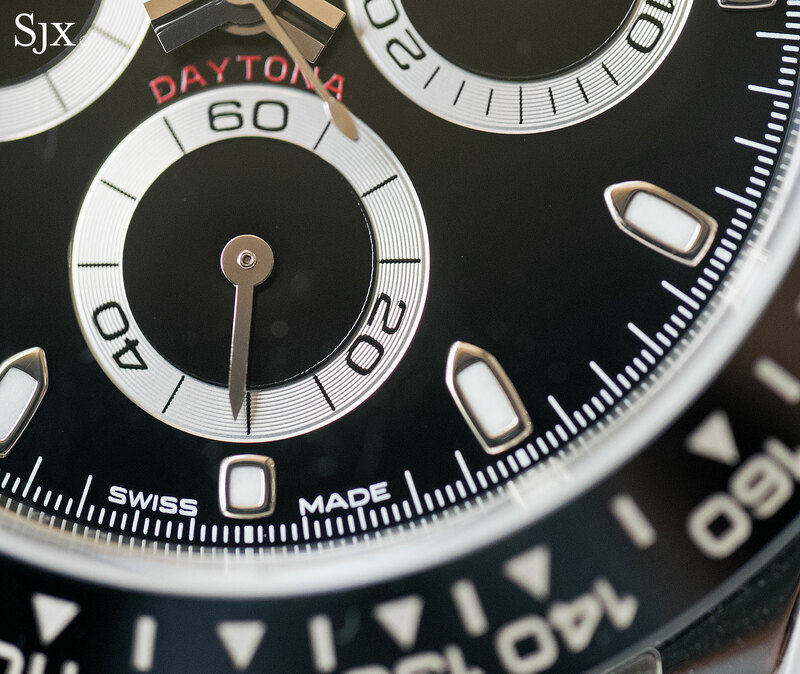 As a mechanical timekeeper the Daytona and its calibre 4130 is wonderful – hardly a surprise for a Rolex. The movement is robust and smartly constructed, with features (namely the column wheel, vertical clutch and free-sprung balance) typically found in more expensive watches. A watch made like this, with such features, cannot not keep good time. Despite the stellar qualities of the Daytona – and the fact that it is indeed hard to get, for now – don’t get caught up in the fanfare. Prudence is advisable. The only way to produce a mechanical chronograph that is as good as the Daytona, for what Rolex charges for them (retail is just over US$12,000), is to make a lot of them. Economies of scale are inescapable in a watch like this. 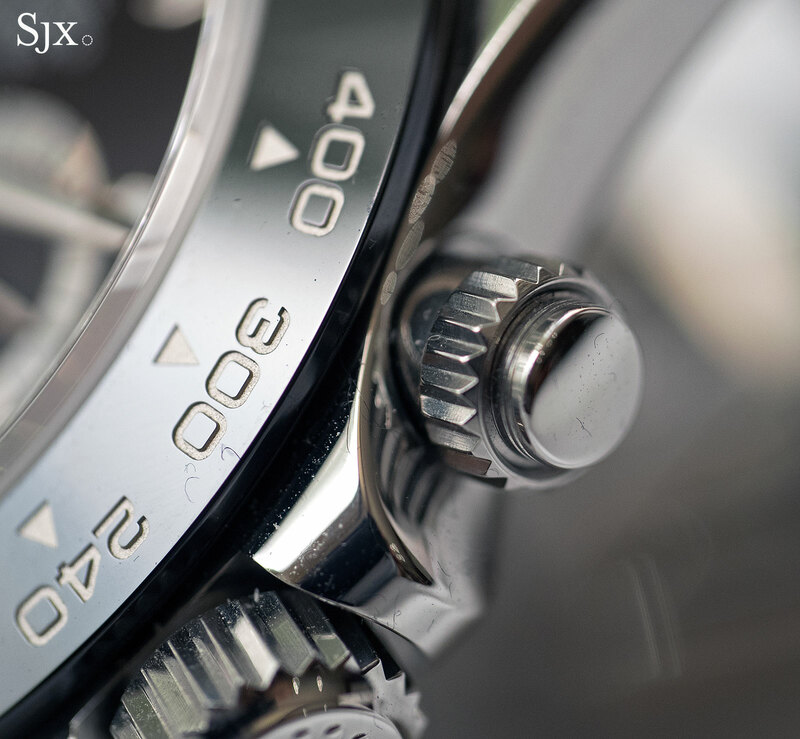 According to the well versed analysts at Swiss bank Vontobel, Rolex produced about 780,000 watches in 2015. 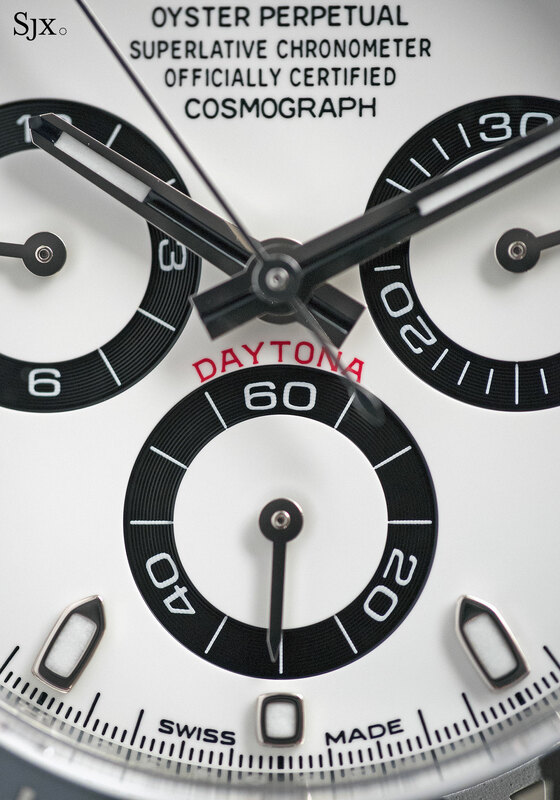 So while the ceramic Daytona is scarce for now, they will be plenty of them to go around because production is continuous, meaning the cumulative number of them will rise. Another factor that will slacken demand is time – once the novelty wears off the bragging rights go away with it. 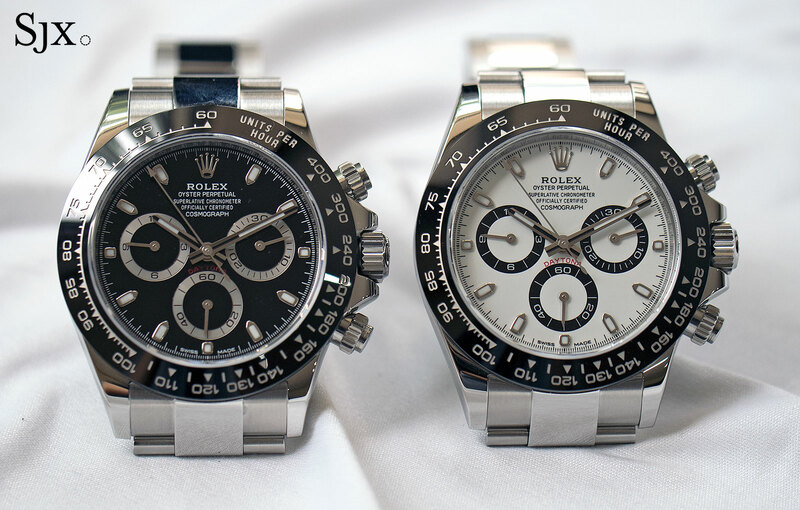 And the thing is, despite the new Daytona being an accomplished watch in any tangible sense, it is almost exactly the same as the old one (the discontinued ref. 116520). With the exception of the ceramic bezel, the rest of the watch is essentially identical. 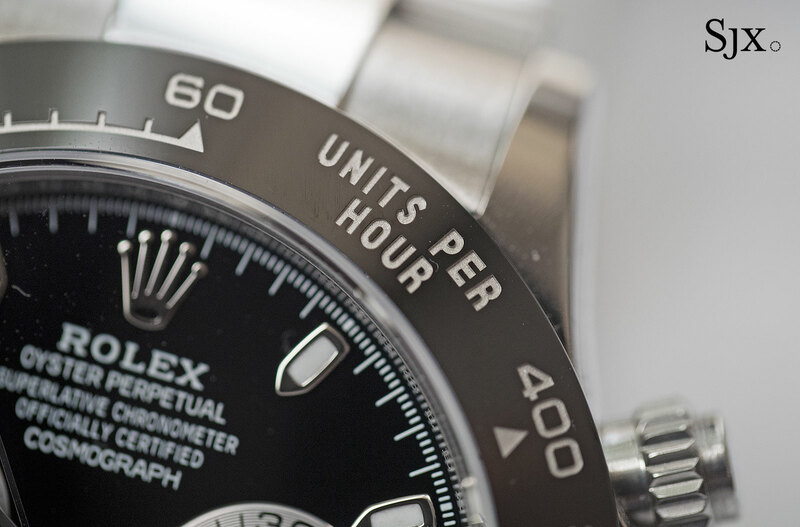 The ceramic bezel, which Rolex labels Cerachrom, is an improvement. It’s progress compared to the steel bezel because ceramic is scratch-resistant. Being mirror-polished, the steel bezel on the old model scuffed easily, with the engraving lettering getting prone to getting marred. While ceramic is brittle, a really, really sharp impact can crack or chip the material, the bezel is practically indestructible in ordinary use. And like the rest of the watch, the ceramic bezel is marvellously well made. The markings are laser engraved and then coated with platinum. 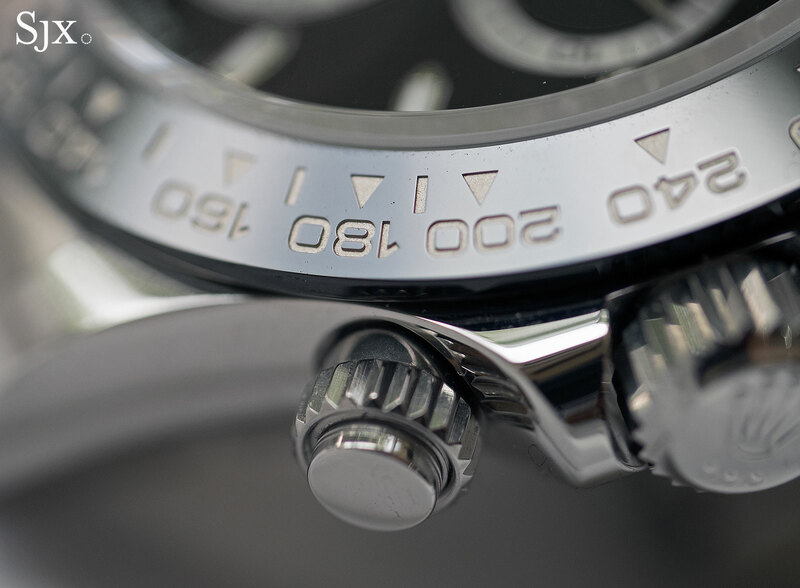 Even under magnification the bezel withstands scrutiny. Though the ceramic bezel is a step forward, it is not novel. 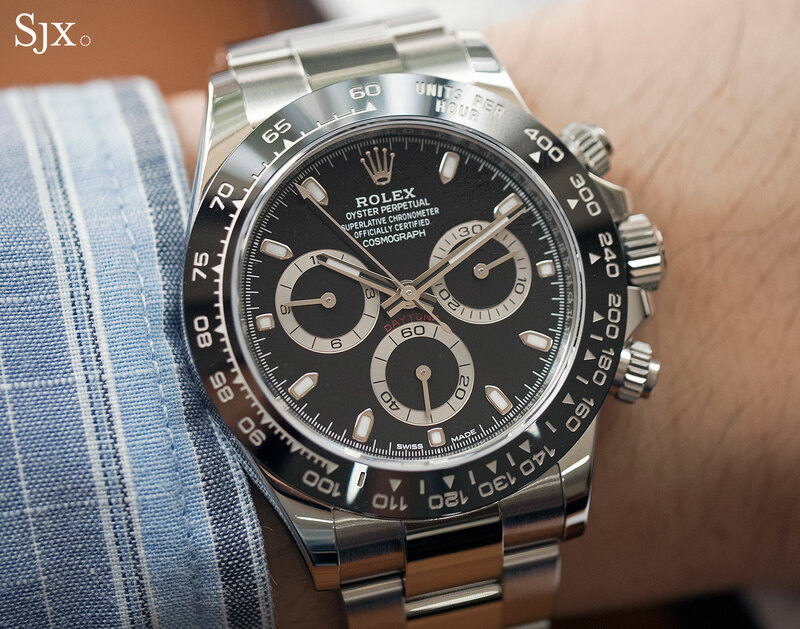 Rolex already took that step a few Baselworlds ago when the Cerachrom bezel made its debut on the Everose Daytona in 2011. 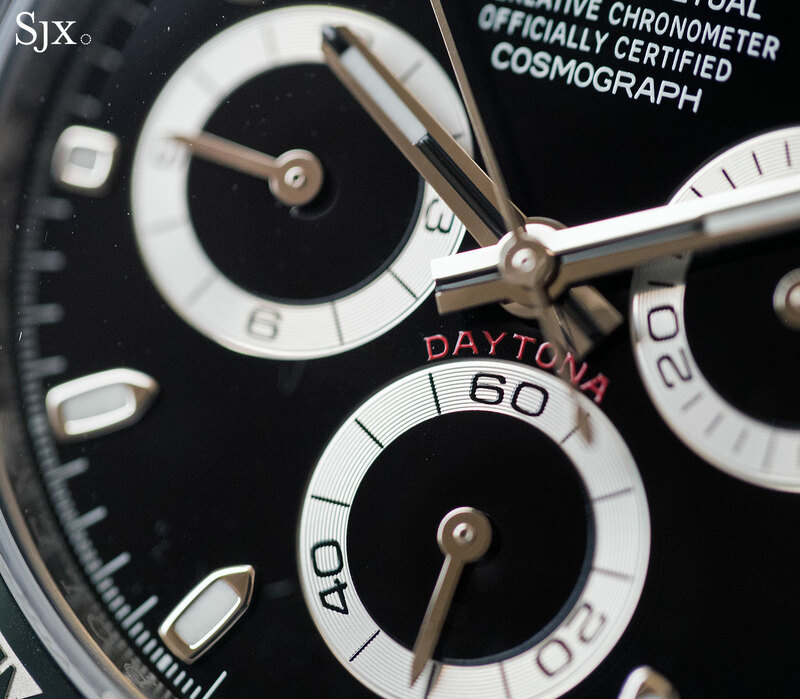 Because demand currently exceeds supply, the new Daytona is offered for sale in lots of places at a major markup to the retail price. Getting on that bandwagon as a buyer is ill-advised. The premium over retail will gradually taper off, as supply catches up with demand. That prediction of supply eventually meeting demand is premised on two reasonable assumptions. 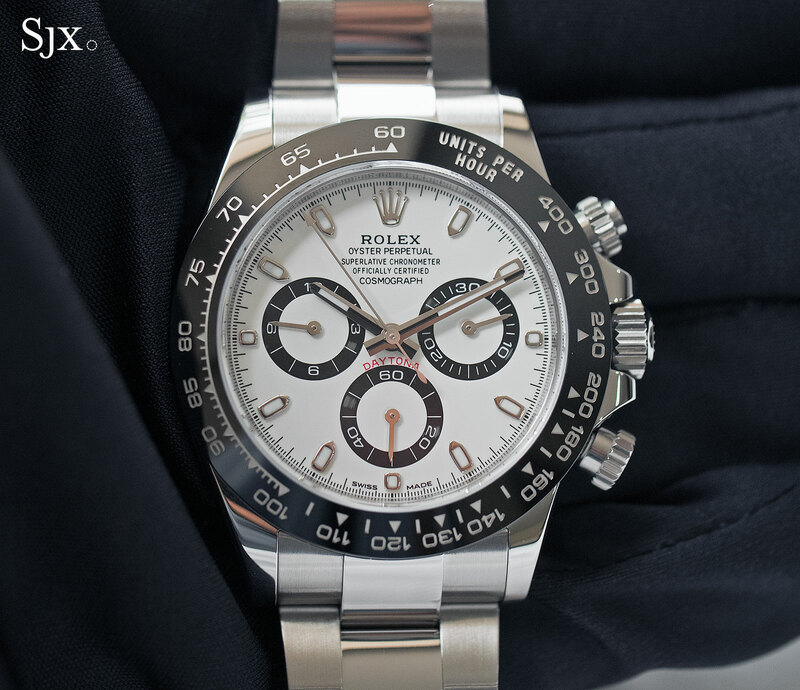 One is the fact that Rolex will continue making the Daytona for some time, simply because it is not cost effective to make such a watch in a small quantity. Just like the remarkably engineered Mercedes S-Class is viable because it is made in large numbers over several years, the same is true for the Daytona. 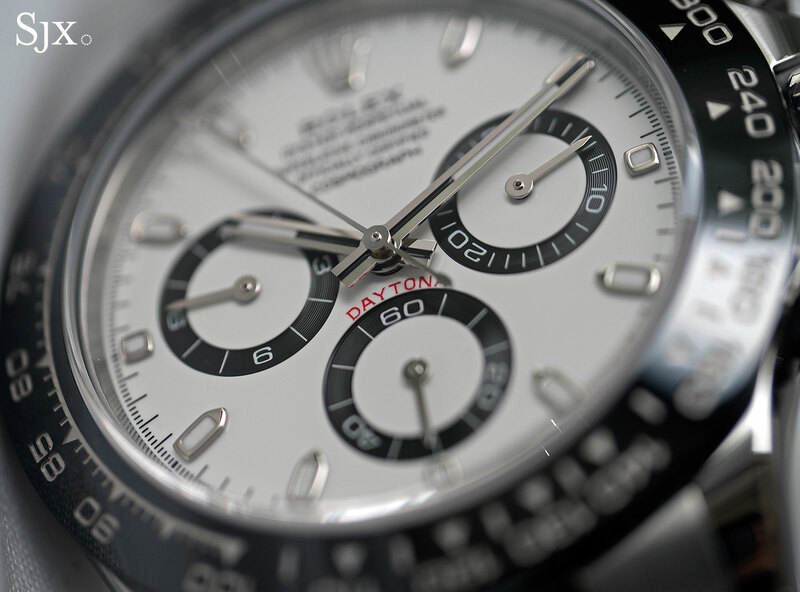 The history of the Daytona and other desirable Rolex sports watches also points to the same. 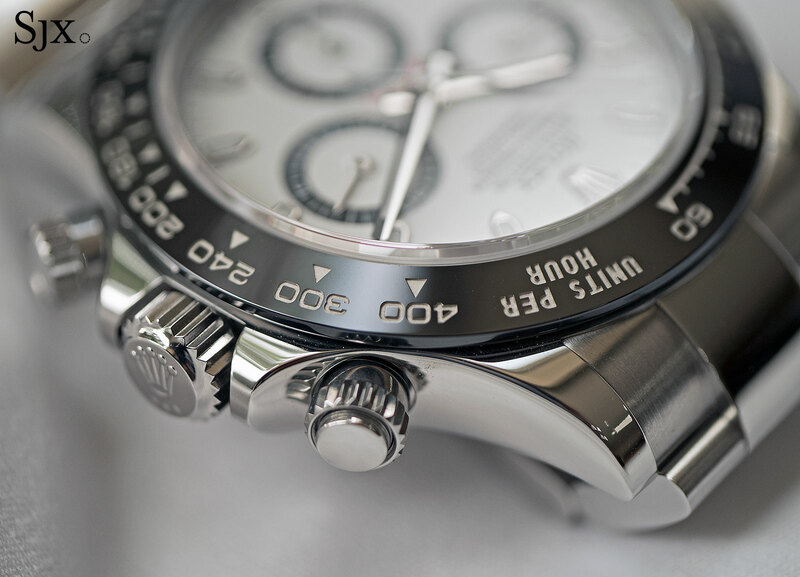 In the 1990s, until the mid 2000s, the stainless steel Daytona was one of the most desirable watches in the world. Back then still powered by the Zenith El Primero calibre 410, the steel Daytona (ref. 16520) was always unavailable. It was a status symbol that consistently sold for more than its retail price. And it’s hard to believe but the retail price of the steel Daytona in the late 1990s was under US$6000. Over the years the retail price went up, while production also rose up once Rolex replaced the Zenith movement with its own in-house calibre at Baselworld 2000. 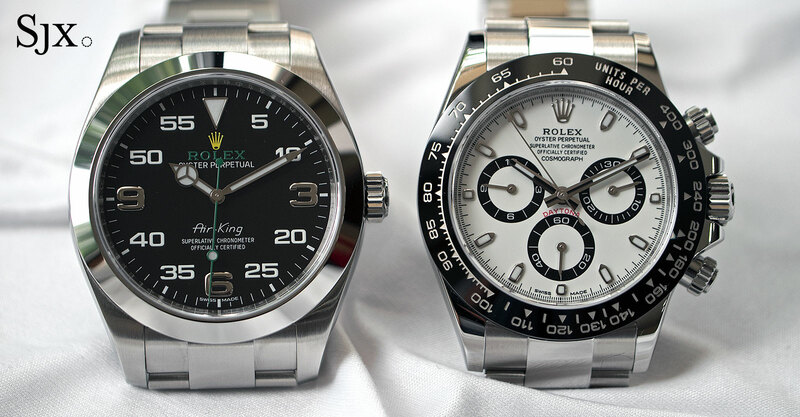 That, along with the growing competition from the likes of IWC and Panerai, nudged Daytona prices downwards. Consequently the “street” price drifted downwards, eventually meeting the retail price as the latter rose. And remember the Milgauss with the green-tinted crystal? When it made its debut at Baselworld 2007 – those giddy days before the Great Financial Crisis when tomorrow looked oh-so-bright – the ref. 116400GV was selling for as much as four times the retail price. That multiple was justified by rumours that the green crystal was defective and would eventually be phased out. Those rumours were unfounded to the chagrin of punters. Any suggestion that the Daytona ceramic will be collectible in the future is misguided, precisely because they are popular. Since they sell well, many will be sold. 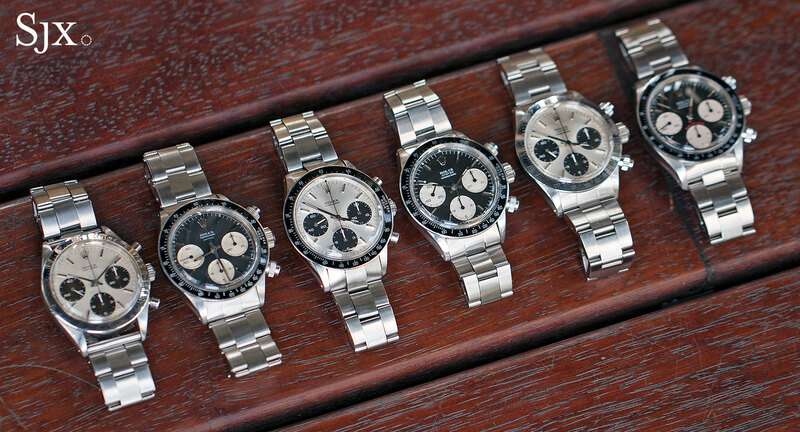 Keep in mind the outrageously expensive “Paul Newman” Daytona was a terrible seller in its time. They were still available brand new in the 1980s and early 1990s, ranking amongst the worst sellers in the Rolex line-up. And now the Paul Newmans sell for a lot of money. So for any would-be Daytona buyer out there: unless the bragging rights are worth several thousand dollars, remember that good things come to those who wait.